Town & Country Federal Credit Union “breaks the mold” by redefining workplace culture in a financial institution. Innovation is not typically a word that comes to mind when one thinks of financial institutions. However, Town & Country Federal Credit Union in Maine pushes the boundaries of what it means to be a pioneer, not only as a financial institution but also as a company celebrating their people. Through their creativity and progressive attitude, Town & Country puts their people first, realizing that to best serve their customers, they must foster talent, wellbeing and productivity. 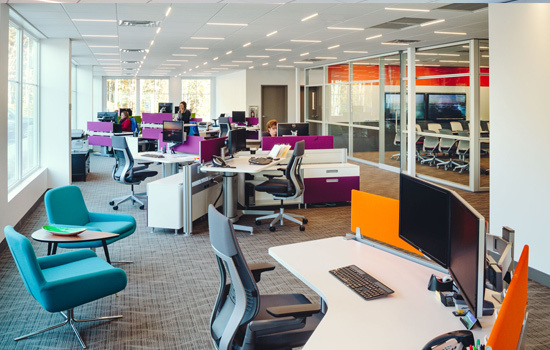 Looking to manage significant growth, Town & Country was committed to building a dynamic and flexible integrated workplace that supported their culture of innovation. With a brand new building underway, the team searched for an workplace solutions partner to help them develop a space that was forward thinking and flexible enough to accommodate future growth. In the end, Town & Country looked to Red Thread for the knowledge, expertise and capabilities required to create a holistic workplace. The leadership team engaged employees early to solicit their ideas and opinions on what they would like to see in the new space. 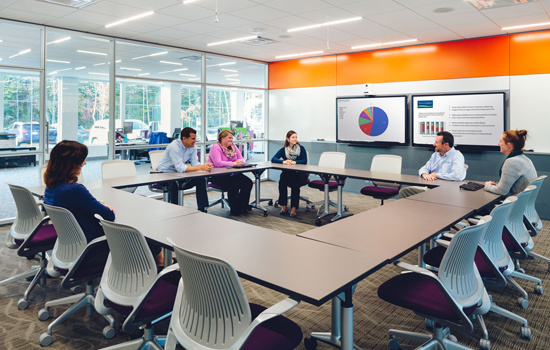 Through surveys and team meetings things like access to natural light, a “fun” environment, more meeting spaces and a feeling of “home” emerged as dominant themes. 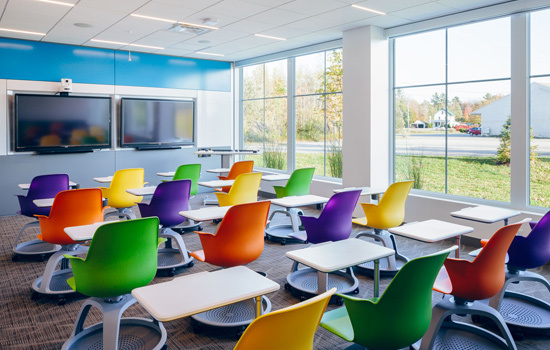 Added to that, the leadership team at Town & Country realized that to accommodate growth they would need products that would allow them to reconfigure without costly infrastructure change. Steelcase V.I.A. demountable walls, carpet tiles and flat wire were chosen for their flexibility, all provided by Red Thread’s internal divisions. The furniture solutions encourage a variety of individual and collaborative work modes. Red Thread’s audio visual team provided technology applications to support digital content display, videoconferencing and room management. The end result is a bright, fun and endlessly functional environment that has resiliency written all over it! A perfect example of how taking a holistic and integrated approach to space planning can offer bottom line benefits! Check out the video project profile of this outstanding space!